Exhibition: 2013 Inter Lubric – China. Date: From Tuesday 24 until Thursday 26 September, 2013. Stand: Lubrita booth / place B31. Wellcome to visit Lubrita International team at B31 stand! Most professional, authoritative and largest international exhibition in China for lubricant industry profesionals. Inter Lubric China has been successfully held annually in Beijing, Guangzhou and Shanghai over the past 13 years, attracting over 1700 exhibitors, more than 60000 professional attendees including manufactures, dealers, distributors and end users, with about 60 seminars and conferences in total. It is the wind vane of the China lubricants industry development and regarded as a must-attend annual event for lubricant professionals. As the biggest annual event of lube industry, Inter Lubric China is ready to greet 2013 with the whole lubricant industry in the main theme of “Development in Transformation, Prosperity by Diligence”. Great support recieved from the sponsors: SINOPEC Lubricant Company, PetroChina Lubricant Company, and Council for the Promotion of International Trade Shanghai, and the co-organizer Shanghai Lubricant Trade Association. Lubricating human resource, consultancy, media and etc. 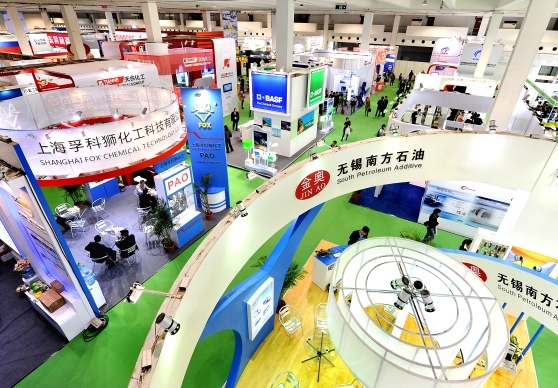 What May You Expect in Inter Lubric China 2013? "2013 China International Lubricants, Base Oil ＆ Additives Conference” will be coming back again during the show, focusing on the latest technology and future application. A series of speeches dedicated to the fresh topics will be delivered. To combine with the characteristics of the manufacturing industry in Southern China, the show will hold a ”Metal working and rust prevention seminar”, together with the theme exhibiting area dedicated to metal working and anti-rust materials and products. As Messe Frankfurt Asiamold show to be held at the same time and venue as Inter Lubric China 2013, “Lubricants application technology in mold industry seminar” will be launched to build further interaction between mold and lube companies. For the better application of lubricants in different fields, during the show there will be “Specially invited Lubricants experts consultation session” to explain and solve the problems of automotive lubricants, industrial lubricants and metal processing lubricants etc. In order to help the lubricants enterprises to expand the distribution channels, the show will invite and organize One Hundred high quality distributors and dealers (especially those who have purchasing intentions), to carry out a “Matching making program” for lubricants exhibitors. To help improve the skills and knowledge of the industry professionals, the show will have “Lubricants distributors and dealers training course” and “Marketing and strategy training course”.